DEKALB Celebrating 100 years of business also means a little national attention for the Farm Progress Show. A talk with Paul Jr. WHEN: Tuesday, Aug. 30, at 7:30 a.m.
WHERE: Just outside the Main Gate at the show site - Decatur, Ill. There are a lot of ways to celebrate a birthday, for DEKALB the answer was to commission a custom-built chopper (that's motorcycle, not hay chopper) from Paul Jr. Designs. But how does a guy not raised on the farm capture the essence of a company that has been in business for a century. "I looked at the logo and I liked it right out of the gate," says Paul Jr., creator of the chopper, and star of "American Chopper" on the Discovery Channel. ROLLING OUT: Paul Jr. rolls to the Farm Progress Show in the new DEKALB chopper. The bike has a range of features from a "woody" look to vintage detailing. Paul Jr. talked with Farm Progress in a phone interview ahead of the 2011 Farm Progress Show, which starts Tuesday morning Aug. 30 in Decatur, Ill. When Paul Jr. (that's how he's known) saw that DEKALB winged ear logo his first thought was that it "had such an awesome throwback quality." But he and his team did more than ask the DEKALB folks about raising seed corn, they talked about the company. "I just think the more you know about a company the more feeling you can get for the direction where they're coming from and where they're going," he explains. "I know some of that was in my head as part of the thought process." Without giving away any details about the new bike, Paul Jr. did explain his design-build process. "Right out of the box we put the frame on the lift and it evolves from there," he says. "There's not even a sketch on a napkin, it comes out of our heads. And that keeps on as the thing grows as we make sure the theme's going and we're carrying that and creating balance. We're unique, no one else is quite the same way we are." And what drove this design? "We really thought about the farmers on this one. We saw that DEKALB logo and we know we have to nail it, then we started to think 'what has kept this company in business for 100 years?' And we created a theme to relate to it in a stronger way." He says he thinks farmers will appreciate what he's created since they work on equipment. "Farmers are very mechanically minded and they'll appreciate the mechanics here the v-twin engine, the transmission. It's reminiscent of the equipment they're familiar with," he says. He notes that his design firm and DEKALB have at least one thing in common: "The recurring theme is innovation." And he says he sees that in what DEKALB does for farmers. Paul Jr. has a strict policy, and working with major companies it's kind of a surprise that he can pull this off: No one sees the bike until the official unveiling. "It is my policy and it is an extremely strict policy," he notes. "Most of the time companies have a sign-off policy to approve items." He notes they take that out. Of course, he adds that those same companies came to him and are probably a little more willing to give him the creative freedom he enjoys. As he talks about the chopper, his passion for his work shines through. "When you see the bike you'll see what I mean," he says as he talks about translating the DEKALB heritage into this new form. "It's a unique design and very specific and fitting. The style, the bones so to speak, have a throwback quality. It's 1912 meets 2012." He notes the finished product has that feel of history, while retaining that modern quality. 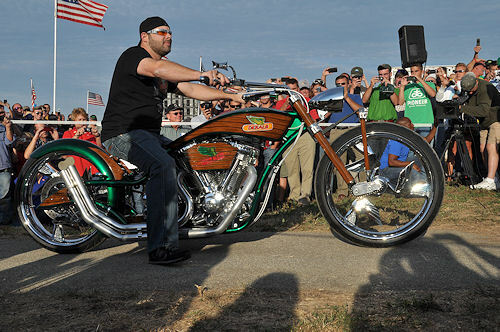 But that policy holds for the reveal on Tuesday, Aug. 30 at 7:30 a.m. outside the Main Gate at the 2011 Farm Progress Show, the first time anyone but Paul Jr.'s team will see the new chopper. Paul Jr. notes his entire team will be on hand at the unveiling including his wife, along with Vinnie and his brother Michael. After the unveiling, the chopper will be on display at the DEKALB lot (#307) for the rest of the show. The unveiling is the culmination of shooting for a two-part episode that will air on the Discovery channel Oct. 17 and Nov. 7, 2011. After the Farm Progress Show the bike is heading out on the road for a multi-state tour including a stop at Husker Harvest Days in September. Stops will include agricultural, customer and farm show events. In January 2012 online bidding for the bike will go live with all proceeds from the sale of the bike to go to the American Red Cross. The online auction concludes April 2012 with the bike being presented to the winner at the 2012 Farm Progress Show in Boone, Iowa.